Cute orangutan postcard from San Diego Zoo:) thanks Louisa! 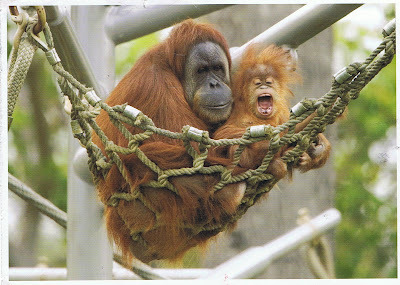 for its first few weeks of life, a young orangutan holds tight to its mom's belly as she swing through the forest. The young orangutan will stay with its mother until 8 or older. When they are about 15 years old, male orangutan develop large cheek pads. Females find these very attractive and when males are fighting, they may resort to grabbing and biting each other on the cheek pads or ears until one of them gives up and runs away.